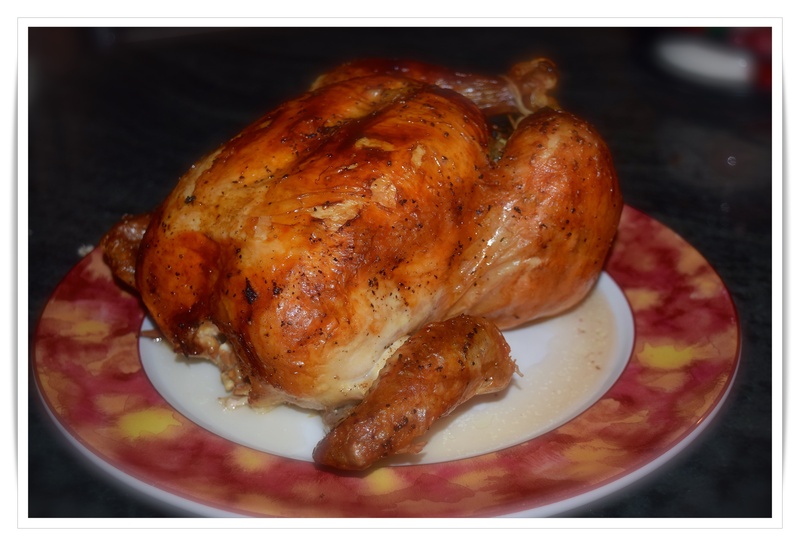 Ina suggests roasting at 425º, but I usually turn the recommended oven temp down after 10 or so minutes as my experience with high temperature roasted chicken always results in the smoke detector going off, you can certainly try roasting at 425º. Check the bird often, I recommend rotating the pan for somewhat even browning. Note: don’t toss the bacon out, who does that? Crispy bacon is great crumbled over a romaine wedge salad. Since I didn’t roast any vegetables with the chicken it wasn’t a big deal to roast some for the pot pie filling then adding in the rest of the rich leftover pan sauce from the roasted chicken to the roasted veggies when they were done. *I also made the FC “sauce” for the pot pies since there was not enough leftover for the large amount of filling for the 9 individual pies. Also, the best cheater crust, circles of Pepperidge Farm puff pastry since I’m not even close to making a good pastry, not my favorite sport! If you crave a good pot pie now and again try making them with a store-bought roasted chicken adding your choice of vegetable fillings. For the filling: 2 cups 1/2-inch potato chunks/cubes and 2 cups 1/2-inch carrot chunks 24 whole pearl onions (I used the frozen ones), quartered 8 mushrooms, 3 cloves of garlic, salt pepper, 2 tablespoons chopped fresh thyme, rosemary, and parsley leaves. 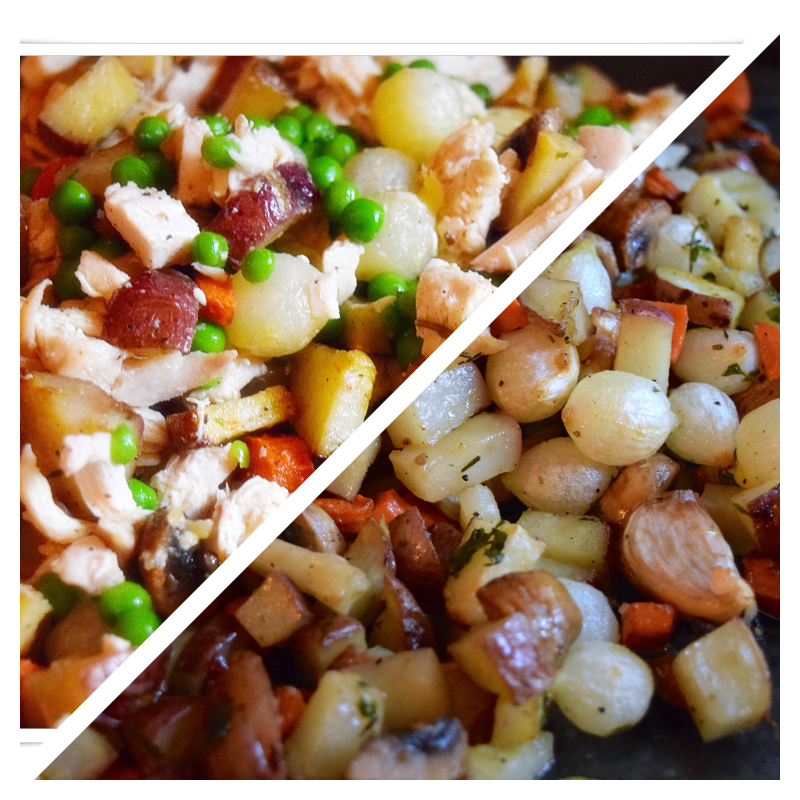 Toss with two tablespoons of EVOO, and roast 20-25 minutes and a little browned (I like the potatoes and carrots to be a little on the firm side since they will cook another 45-50 minutes in the pies. Cut chicken into pieces or pull shreds of chicken then toss with the vegetable filling, pour in the sauce a little at a time and gently toss. One package of frozen peas (Green Giant regular peas) was the perfect amount for my pies, simply than under warm or hot water and allow to drain before blending into the filling. ***2. For the FC sauce start with the roux, 6 tablespoons each flour and butter whisking and cooking for 4-5 minutes, add 4 cups of chicken stock about 1 cup at a time and season with salt and pepper bring to a boil, and simmer. Stir often for another 10 minutes. Gently stir into the chicken and vegetable pie filling. I had enough for 9 individual pies or you can use a large baking dish and a full pastry sheet cut 1/2″ larger than the dish. Brush pie tops with beaten egg yolk and a bit of cream or 1/2 + 1/2, bake at 350º for about 45-50 minutes or until hot and bubbly and beside to rotate once or twice again for even browning.